Discussion in 'The Small Company Luthiers' started by XKnight, Jul 16, 2008. I've been looking for the right Mel for quite some time and found a Minty Vintage Artist so I took the plunge. I got to meet Gerard this weekend. He was very nice and makes a great guitar. Congrats! Here's a picture of the guitar. Anyone else have this pup configuration? Does that baby have coil splits (push-pull pots)? I don't think so, it's not mentioned on the spec sheet nor did the seller advertise it as such. Maybe I'll get a surprise though when it arrives. Yours isn't really a Vintage Artist (anymore anyway). 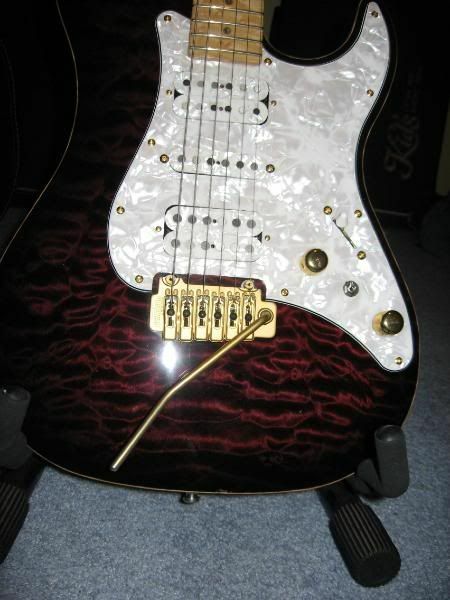 A VA was just a Classic Artist with 3 single coil pickups instead of H/S/H or S/S/H. So theoretically yours is actually a Classic Artist because of the pickup configuration. Because of the 3 pots I'd guess it used to have 3 singles but someone upgraded (Gerard routes all of his guitars H/S/H if they're going to have a pickguard). Do you know what kind of pickups they are? Each Mel is a work of art. Wish the one I had had a bigger neck, I would have kept it! I don't have the guitar yet, but here is the spec sheet. It says it's a "Vintage Artist" made in 2002 and the pups originally were Melancon Blues SC. I'm not sure what pups are in there now. I asked the seller if the guitar had been modded, but I never got a response. I decided to take a chance and buy it anyway. I think that may ne the one I almost bought - was that in England ? how do those Rio Grandes sound compared to the Dimarzzios Gerard uses? OP - CONGRATS on the score - you will love it~!! I've not found a finer guitar since I first played my own Melancon early 2004. Nothing's touched it. That's great to hear. Mine is out for delivery now, so with any luck it will be waiting for me when I get home from work. I'm with Scott on this. I've added two more Mels since the first one and sold off many other guitars. Congrats, let us know how it works for you. It arrived and it's a beauty. I'm just not sure if I'm going to bond with the standard neck carve. I usually like thicker necks. It does have the coil splits. Nice guitar! It definitely started with 3 Singles (per the spec sheet), but as I said Gerard routes all of his guitars for H/S/H so someone just upgraded the pickups at some point. I love Gerard's standard carve but that's a very personal thing obviously. Give it some time and let us know how everything ends up.